One of the best weapons you have in your battle against debt is the 0% credit card balance transfer. With the right credit card, you can get a 0% rate for a few months. During this time, it’s possible for the entire amount of your debt payment to go toward getting rid of your balance. This speeds things up since your payment isn’t being eaten up by interest charges. The faster you pay down your debt, and the less you pay in interest, the better off you’ll be. The best balance transfer credit cards allow you to make significant progress in your debt pay down efforts. Use these credit cards as a tool in your debt repayment plan and they can speed up your debt payoff and save you money over time. The MBNA True Line Mastercard offers borrowers the opportunity to have a credit card with a low-interest rate, without the cost of an annual fee. With a standard rate of 12.99% on purchases, cardholders carrying a balance month-to-month can maintain the convenience of a credit card, while getting out from under the weight of higher interest rate cards. Speaking of high-interest rates, MBNA has sweetened the pot by offering an introductory 0% interest rate for 10 months on balance transfers. This way, you can move balances over from higher interest cards, and at 0% for a limited time, save money while you pay down the amount owing. A note of caution, however, the interest rate for cash advances on this card is a whopping 24.99%, and something you want to avoid. 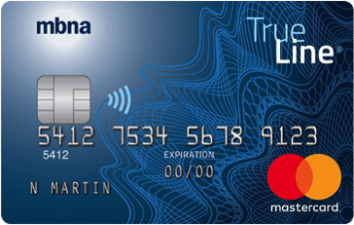 There is no minimum annual income requirement for the True Line Mastercard. With so many credit cards now having a minimum income threshold, it’s nice to see MBNA make this card accessible to borrowers at all income levels. They’ve also included $150,000 of travel accident insurance, as an added bonus. The MBNA True Line Mastercard is ideal for borrowers who carry a credit card balance, and having the ability to take advantage of the 0% balance transfer offer makes it even more attractive. If you then pay each Minimum Payment on time for  consecutive Statement Periods (“cure period”), the new Standard Rate(s) will decrease to the Standard Rate(s) that applied on your account at the time of the change event. Such rates will apply on the first day of the first Statement Period that occurs after the cure period. ✪ Balance transfers will be fulfilled in the order listed and are treated as balance transfers in accordance with your Account Agreement. The total value of balance transfers cannot exceed your authorized credit limit. If the value is greater, MBNA may send a partial payment to the named creditor/designated account. THERE WILL BE A TRANSACTION FEE EQUAL TO 3.00% OF THE DOLLAR AMOUNT OF EACH BALANCE TRANSFER INITIATED WITH THIS APPLICATION. A MINIMUM FEE OF $7.50 WILL APPLY TO EACH BALANCE TRANSFER TRANSACTION. A balance transfer may not be used to pay off or down your account balance or any other balances with us (including our affiliates, which would include any member of the TD Bank Group). The Toronto-Dominion Bank is the issuer of this credit card. MBNA is a division of The Toronto-Dominion Bank. Earn 1 Best Western Rewards® point for every $1 in eligible purchases‡. Earn 5 Best Western Rewards® points for every $1 in eligible purchases at Best Western properties‡. Earn 20,000 Best Western Rewards® points†† on your first purchase – enough for a free night stay. You will be awarded “Gold Status” upon first use of your credit card and “Diamond Status” when you spend $10,000 in eligible purchases within one year◊◊. No limit to the Best Western Rewards® points that can be earned using the credit card in a year. With the Best Western Mastercard® credit card, you can get a low interest rate of 1.99% for 10 months. Even though it’s not the same as a 0% balance transfer, it can still save you big time. You pay less in interest, and have the chance to really demolish your principal. Not only that, but the Best Western Mastercard® credit card comes with a rewards program. You earn one point for every $1 spent on eligible purchases, plus five reward points for each dollar spent at Best Western properties. You can redeem these rewards for hotel stays, status upgrades, dining, airfare, and more. Plus, with your first purchase, you get 20,000 Best Western points — enough for a free night’s stay. You do want to make sure you pay off your purchases as you make them, since there is a regular APR of 19.99% on this card. You also want to get your balance transfers taken care of in the first 10 months because the balance transfer APR is 22.99%. There is no annual fee for this credit card, and you get access to Mastercard benefits like fraud protection and 24-hour customer service. If your Minimum Payment is late twice within any 12 consecutive Statement Periods (the “change event”), the Standard Rate(s) that apply to your account at that time will increase 5% to a maximum of 29.99%. The new Standard Rate(s) will apply on the first day of the second Statement Period following the change event. If you then pay each Minimum Payment on time for 12 consecutive Statement Periods (“cure period”), the Standard Rate(s) that apply to your account at that time will decrease back to the previous Standard Rate(s) prior to the rate increase on the first day of the first Statement Period that occurs after the cure period. Earn 10 PC Optimum points for each dollar spent with the card. Earn 20,000 PC Optimum points as a signing bonus, plus a $100 e-gift card. Redeem PC Optimum points for groceries and more when you buy President’s Choice items. Balance transfer rate: 0.97% for six months. Regular balance transfer APR: 22.97%. Once again, the President’s Choice Financial Mastercard card isn’t a true 0% interest rate card. However, you can benefit from the 0.97% balance transfer rate for six months. This means you have six months to significantly reduce your debt. It’s a good way to aggressively pay down debt. It’s important to pay down what you can, since the regular balance transfer rate is 22.97%. You can also earn rewards with the President’s Choice Financial Mastercard. You get 10 PC Optimum points for every dollar you spend — no matter where you shop. Your points can be redeemed for groceries and more when you shop President’s Choice items. Plus, you get up to 20,000 PC Optimum points as a signing bonus, plus a free $100 e-gift card. As long as you are careful to pay off your purchases when you make them, and as long as you work to pay down your debt, this can be a great card choice. On top of that, if you meet income requirements, you might qualify for the President’s Choice Financial World Elite Mastercard. This card allows you to earn 30 PC Optimum points for each dollar spent at participating grocery stores and at Shoppers Drug Mart and Pharmaprix. You can get bonuses at Esso stations and for certain travel services as well. Plus, this version of the card comes with the 0.97% APR on balance transfers for six months and no annual fee. A 0% interest rate credit card can be a great tool to help you pay down debt and get on top of your finances. However, you do need to be careful. First of all, many of these credit cards charge more once the time is up. If you haven’t paid down your debt dramatically, you could end up paying even more on your debt. Choose a balance transfer card that has a longer intro period, if possible. A card like MBNA Platinum Mastercard is a good choice because you have a full year at 0% APR. That gives you time to really plan ahead. If you transfer $4,000 in balances to the 0% interest rate card, and you have a year to pay it down, that’s $333.33 per month. See if you can free that up each month to get rid of debt quicker. Other cards might not offer a long introductory period, or you might have to pay a small amount of interest, like 0.97% or 1.99%. Even in these cases, you can make a significant dent in your debt if you plan ahead. Your best results come when you commit to putting a set amount toward debt reduction and you stick to that. If you know you can’t pay off the card in the set period of time, it can help to choose a card, like the Scotiabank Value VISA. You’ll have a relatively low rate when you’re done. Pay down as much as you can during the intro period, and then keep it up. You’ll still make decent progress, and it’s much better to pay 11.99% than it is to pay 22.97% interest. The goal is to pay off your debt as fast as you can. 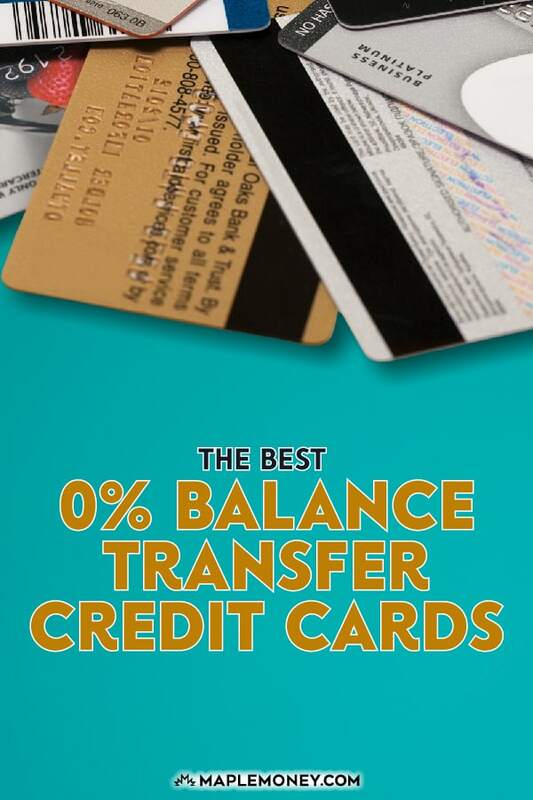 With a good plan and discipline, a 0% APR balance transfer card can help. Citi , chase, diiscover and many others credit cards companies are offering 0% for balance transfer but in canada we have nothing. Is there a one-time transaction fee or administrative fee associated with the MBNA offer? I had to pay $100. for this mbna 0% so there is an initial charge that is not apparent until you ask. there is no fee for the card but a transaction fee for the balance transfer. And it is tranoarant not hidden. there is no fee for the card but a transaction fee for the balance transfer. And it is transparant not hidden. I have used mbna many times be aware there is a 1% APR, some kind of handling fee. Other than that it is great. Hi T, the Platinum Plus 0% interest card charges a handling fee . Even Tom did not know about the $100. 4 BIG DISCLAIMER if you are going to be using this strategy. 3- payments are on a 2 tier system. say you borrowed 7499.25 total owed on zero balance. That is a win for you and you can invest/or replay debt it anywhere as long as you get a better than 1 percent investment) However if you purchased something at 100 then that on tier 2 and charge at 18.99%, NOW the C.C. got you you need to pay first tier 7499.25 first while the tier 2 system is revolving at 18.99%. SO DO NOT use this as a purchase card only treat it as a financial institution free borrower. 4- HUGE ONE TO NOTE- IF you EVER MISS 1 payment then you get the whole amount 7499.25 charged pro rated back at 18.99 percent, and in the fine print they can reduce the borrowing total and damage your credit rating. This aside if you know the risk then take advantage of it. A 1 percent interest rate certainly sounds great, but I think the bottom line is that there are so many ways you can incur extra charges that on balance it’s really not an attractive offer. The best way is to set up a preauthorized payment immediately and have a plan to pay the balance in full by the promotion expiry date. I have done this many times over the years but you have to be vigilant and review your monthly statements to be sure that you are charged the appropriate amount. if you miss a oayment you lose your promotion,but the contractual rate is only for the balance that is remaining.They do not go back to dolkar one. Check the fine print (with a magnifying glass)?